Club Penguin Cheats by Mimo777 Club Penguin Cheats by Mimo777: New Club Penguin "Collectibles" Coming! Club Penguin is amazing! They are always coming up with awesome new ideas! Check it out, they will be launching something BRAND NEW at the end of this month! Wow! What could these be? Club Penguin says there are going to be A LOT of them and we will need to collect them! They kinda look like stamps to me. I think Penguin Mail will start to have stamps and we will be able to collect them? What do you think? Let me know! I think they look like stamps too, but they could also be like badges or something. Maybe they'll be stamps and there'll be a hunt or something! Cool, they look like stamps of some kind... or they could be badges. That's what I think too! This is gonna be awesome, don't you think? I know they bare stamps because when you hover your mouse over the picture it says stamps.most likly cp is going to make collectable stamps that you you in real life. I think the unknown objects are stamps. Before we had to pay to send mail. Maybe this is an alternative! Instead of paying to send mail you can collect stamps. And maybe the different shapes are for different types of mail. Yea, stamps, badges, or maybe, Stamp Badges! Eh, it's a thought. Originally, within the first hour that these were posted, they were named "Stamps" in Billybob's files. When you rolled over the image it said that! I told CP this and they CHANGED it so it is not called "sneakpeek" but it ORIGINALLY was stamps! So, that proves they are stamps. Stamp hunt! Maybe there will be a stamp hunt every week. That would be cool! Stamp hunt! Maybe there will be a stamp hunt every week! That would be cool! 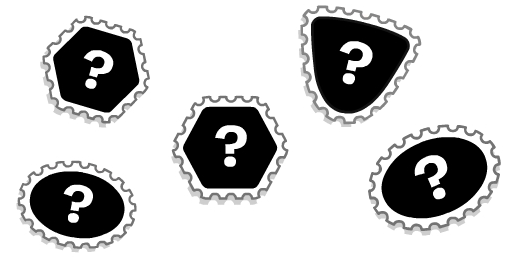 ''Stamp'' EPF badges! lol. Maybe they can stick on the back of your EPF Spy Phone. The more stamps you have on your Spy Phone, the more permitted you are to doing things! That would me my idea on that anyway. They could be both! They could be Stamp Badges! Whatever those are. lol! I would like to collect Jelly Beans! Jelly Beans are awesome. There so chewy and filled with sugar! Sugar sugar sugar! I Think they could be stamps or badges too infact!! WE NEED TO WAIT 21 DAYS FOR IT!! Good thought. Maybe we can also trade stamps. Trading them would be cool. Maybe. I wonder if Club Penguin will ever make it so we can trade Card Jitsu Cards. I would like to see that. Mimo posted about this a couple posts back,great job finding it yourself though! Great theory! I think they look like badges too! Bobhead found this too. Good job finding it yourself! We have a winner! Ding ding ding! Good job Bob! Hey it rhymes! *Sings* Good job... Bob, Good job... Bob! Maybe they are for different areas! If we want to send them to a different area, we have to buy a different stamp! They do! Maybe we have to collect them, during Field ops! I hope not! Maybe stamps would cost more, that would be bad! I'm poor enough on CP as it is! I know they are stamps because of some other comments, but I have a theory of what they could be for. Maybe, we could pay extra for postage, but we can type out the card ourselves! That might not be the brightest idea, because of people saying bad things, but they could go to Club Penguin moderator first. The Moderator could approve of the card first, then send them off the the person it was inetended to go to. If the card says bad things, the person could be banned, or have the privelige taken away of typing out the cards. Wow, that was long! Does anyone else think this is a good theory? Maybe! Billybob did say we would HAVE to find a lot of them! Yep, those or stamps! I have a feeling it's stamps, but they could be anything! Probably stamps... On some computers when your mouse goes over it, it says "stamps.jpg"! Maybe so! Tootsville and CP seem to have a rivalry, because a lot of CP bloggers like MImo have Tootsville ads on their websites! Yea, that would be fun! I want to see the Card Jitsu Water outfits SO bad! It might be, or it has to do with the EPF! Mail doesn't really cost that much, but I would still like that! Yep, a few people have noticed that! Great job Slidoo! That would be AWESOME! You could also stamp the stamp wherever you wanted! There are so many things this could be! i was jamin and found the candy apple pin is back! Wow Cool I Cant Wait! Hey Mimo! I told you so! when i wrote my comment in the july events article i said they looked like stamps! and i said we will have more then just postcards now. I am thinking badges !! BTW Love ur site !! if you throw a snowball at the casa fiesta you can throw confetti instead! IT ROX UR SOX OFF! Ihave an Idea clubpenguin should make an inventing party!!!! If u haven't noticed, mimo put an update under the comment that said that the candy apple pin wuz back. Stamps. Definitely. But what about the mystery pix on 'em? Maybe they're pictures of penguins or something. I agree with you mimo! It looks like stamp to me maybe we have to send to our friends and they will get. They will probably send us too! I agree with you Mimo, stamps! In other news, you may want to look out for people playing instruments. Sometimes their clothes come off of them. (This happened yesterday though so CP may have fixed it). I think that it will be something that you can add to the mail like stamps. we will be able to collect the stamp and use it as a pin! Sort of stamps i think. But then again Disney just want money. They might be key rings baadges stamps or somthing to do with feild opps checats or something! My birthday is at the end of the month its my birthday present from clubpenguin!! lol! Cool idea! You are one smart cookie! Mmmmm... cookies. You win a giant cookie! LOL I'm kinda obsessed with cookies at the moment. Im trying to become a member but when I fill everything 100% correctly it says: DECLINED! Why?! Yeah! It was probably only a glitch because of the Music Jam! Free items? A lot of them aren't the same! But you are right, CP has a lot of member stuff. They have to do that to make money! I hope it has to do with the EPF! This is gonna be great! I am thinking stamps, but it could be anything! Sweet! I can make confetti fall on me! Thanks for the tip! It is! It's grown back after Mimo ate it. XD Don't eat it again Mimo! That is what I was thinking! I guess we will have to wait and see! Maybe because Club Penguin seems pretty involved with the EPF lately. I think we get to do something like an e-mail thing with the stamps. Good theory! I was always thinking what it would be like to have a conversation over postcards so nobody else could see! I think they are pictures of the EPF. Collectible stamps for the EPF maybe! I always recall her name being Cadence! If your using a credit card, it might be the credit card being declined. If not, you should contact Club Penguin about it. I think they will be like the Pins. Club Penguin has had about 200 pins, and I think that will be it, but stamps! You gave me an idea! Maybe CP could start a real postage line! That would be awesome, just randomly buying cheap postcards, because inside they have a code for 500 hundred coins! The idea train stopped at my station today! You need an award dude! You have so many awesome ideas! Yeah, I've seen lots of simalarities to other games lately! Well, I call The Backstage, Coffee shop *Yummm*, and the Rooftop! i was just going to say they look like stamps!!! im thinking that were going to have to collect stamps- and it will be related to the club penguin mail, or the stamps will be real (not on cp) and u have to collect em. badges is a good idea- they do look like them. they could be, like some peeps said, stamps OR badges. thats a likely idea too- that would be cool! They look like stamps or gears!!! Maybe they are stamps and if we collect them all and send them into club penguin, they will give out a prize! Technicly I read Billybobs replies on comments and one penguin said: Im just guessing here, but are those pins? Or stamps? Even if i get them wrong i'll still be excited about them at the end of July! Waddle on CP! And Billybob said: GREAT guess! So it could be a pin for our player card or something in a album! I think they're stamps for penguin mail (like you said) so they can be used to send mail to more than one penguin at a time! I think they're stamps and you get to collect them. You get to collect them like pins, each month there's a new stamp, except that they'll be a lot harder to find due to the fact that you can use them in your penguin mail. What I mean by being able to use them in the penguin mail is that you'll be able to choose what postage stamp you want on your postcard. You can also view your collection through the mail pane by clicking on a stamp button somewhere on the page. This will increase the use of the penguin mail which seems not to be used as much as the Club Penguin staff might want. Great observation, but it could also be what Mimo saved the picture as on his computer so he could put it onto the blog. the first stamp on the page is now showing herberts side kick!